The scholar John Henry [Jan, or Johann, Hendrick] Hessels spent most of his working life in Cambridge. The son of an engineer, he was born in 1836 and raised in Haarlem, and his entry in Venn’s Alumni Cantabrigienses tells us he ‘lived in Cambridge for some forty years, working daily in the University Library’. He studied the history of printing in Holland, he edited Lex Salica, and most important for early modern scholars, he transcribed and published the archive of the Dutch Church in London. It is the metadata for these letters that EMLO is publishing volume by volume at present. The archive consists of more than 4,400 letters which span the years 1544 to 1874. Following a major fire at the church of Austin Friars in 1862, the correspondence archive and the Church’s library were deposited in the Library of the Corporation of the City of London at the Guildhall. At this point the archive contained the correspondence of the cartographer Abraham Ortelius (which was published earlier this year in EMLO) in addition to the letters concerned with the affairs of the Church and its members. Hessels, who was admitted to St John’s College, Cambridge, on 21 November 1894, arranged for the archive to be removed in 1884 to Cambridge University Library. There he prepared the letters for publication and, after completing two volumes (that of the Ortelius/Collius collection in 1887 and then the letters of the members of the Church in 1889), worked to reorder a significant number of letters — from boxes that came to light subsequently — into a chronological listing for a two-part third volume, which came out in 1897. To date EMLO has published records for the letters contained in the first two volumes of Hessels’s edition and will be working to upload metadata for the letters in the third volume in the later months of this year. This catalogue is a welcome addition to the growing list of EMLO’s ‘archive collections’ which may be consulted via the thematic listing page. With the exception of the Ortelius letters — these were dispersed via the saleroom to fund repairs to the Church following damage during wartime air raids — the manuscripts may be consulted today in the London Metropolitan Archives. They make up a fascinating collection and chart the history of the Church and its members from the earliest days and the grant, in 1550 by Royal Charter, of the nave of the former friary church at Austin Friars. Following publication of the third and final volume, Hessels returned to his work on Latin-Anglo-Saxon glossaries. 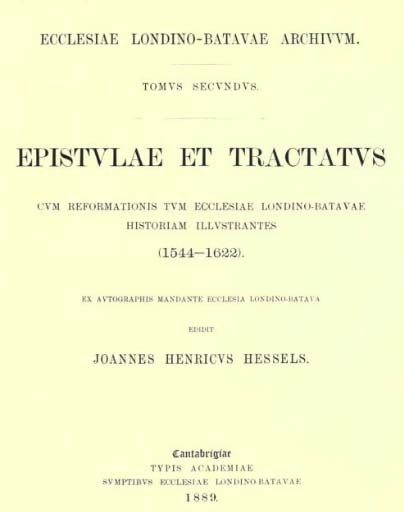 The publication of this archive of the Dutch church in London has proved his magnum opus, however, and volume two alone enables scholars to consult letters from the first superintendent of the Church John a Lasco [Jan Łaski], from Reformed theologians Theodore Beza, Martin Bucer, Heinrich Bullinger, and Jan Utenhove, from scholars Lipsius and Junius, and from a host of politicians and diplomats, Walsingham, Burghley, and Duplessis Mornay to name just a few. We hope you will enjoy exploring the letters from this rich and varied archive and will follow the links provided to consult Hessels’s printed texts. And as you make use of the resource we trust you will not emulate its editor too closely (for details you’ll have to consult Hessels’s entry in Venn)! This entry was posted in Uncategorized on April 30, 2016 by Miranda Lewis. I am particularly excited to be announcing the publication of EMLO’s first art historical correspondence, that of the Flemish painter Peter Paul Rubens. 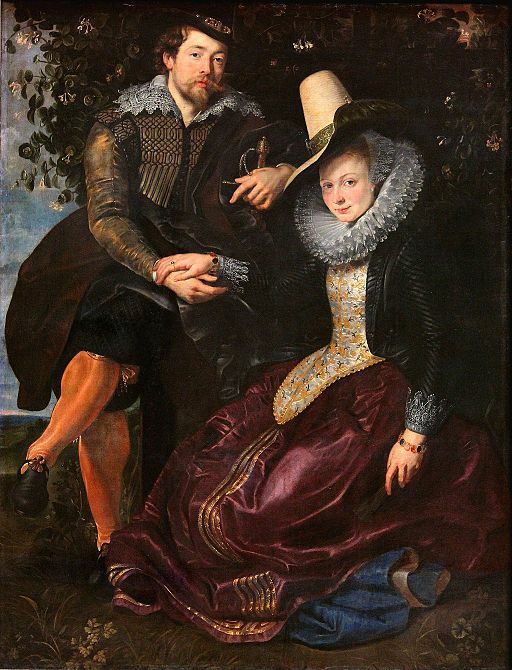 For those who have not delved into this painter’s letters before, I should explain that the majority of Rubens’s surviving correspondence is related to his alternative career as a diplomat — he embarked upon this path in his early twenties, working for the Gonzaga in Mantua, and from 1609 was employed in the service of Archduke Albert and Archduchess Isabella in Brussels. Rubens travelled extensively through Italy, Spain, England, and the United Provinces, and as he travelled he dispatched letters, reports of situations, and accounts of his work. Rubens was a close friend to a number of scholars, including Peiresc and Pierre Dupuy, as well as to printers such as Bathasar Moretus, to fellow painters Jan Brueghel the elder and Diego Velázquez, and he was a devoted and caring husband and father. It’s unfortunate that so little of his personal correspondence appears to have survived. Charles Ruelens (1820–1890), inaugural editor of the Codex Diplomaticus Rubenianus (upon which EMLO’s calendar is based), speculated that the number of letters written by Rubens himself over the course of his life — just one side of the correspondence — could have been close to eight thousand in total. From the invaluable six-volumed Codex Diplomaticus Rubenianus, which was initiated in 1887 by Ruelens and completed in 1909 by Max Rooses (1839–1914), and the edition of English translations published in 1966 by Ruth Sanders Magurn, we know today of just 250 letters from Rubens. Despite the overriding diplomatic content of most letters, at times Rubens could not resist mentioning his own painting — his ‘dolcissima professione‘ — as well as the antiquities, art, and coveted collections he encountered. It’s worth noting that significant further work within EMLO could be done on the metadata for these letters: for example, it would be useful to identify the works of art mentioned in the texts, to record, and to link them and, in time, these might form part of an index of works of art mentioned in correspondence which could be charted in particular places at given points in time; people, places, and events mentioned could be identified also and linked within the union catalogue; keywords could be added; manuscript versions and their material details could be collected. There are many lenses through which this correspondence could be examined, and EMLO would welcome enquiries from students searching for topics and subjects on which to work who might consider in the course of their research enriching this, or similar, correspondence metadata. EMLO is extremely accommodating, willing to assist, and anyone interested in working with correspondence in the union catalogue has only to be in touch. Whilst considering the enrichment of existing resources, I would like to mention also a call released recently to doctoral students or post holders at Higher Education Institutions worldwide and to individuals undertaking scholarly research in the humanities. The Oxford Dictionary of National Biography is offering three research bursaries of £750 each to promote the ODNB online as a source for new research in the humanities. These bursaries are intended, via a defined research project, to promote understanding of British history and culture by means of the Dictionary’s content and its biographical data. Applications should be submitted by 12 June 2016, and further details, together with an application form, may be found on the ODNB website. This entry was posted in Uncategorized on April 22, 2016 by Miranda Lewis.